Edingurgh : Young J. Pentland, 1888. Description : [xvi], -270 ; ill.: 116 figs. ; 23 cm. Photographs : figs. 49-59 & 81-83 are in-text autotypes. Subject : Brain — Tumors; aneurisms. Author caption: BY BYROM BRAMWELL, M.D., F.R.C.P.E., F.R.S.E., LECTURER ON THE PRINCIPLES AND PRACTICE OF MEDICINE IN THE EXTRA-ACADEMICAL SCHOOL OF MEDICINE, EDINBURGH ; ASSISTANT-PHYSICIAN TO THE EDINBURGH ROYAL INFIRMARY. President of the Royal College of Physicians, Edinburgh, 1910. Surgical section written by A[rthur] W[illiam] Hare, 1861-1923. Index Medicus: 11408881050, 20207411240, 20207411230, 11408881060. 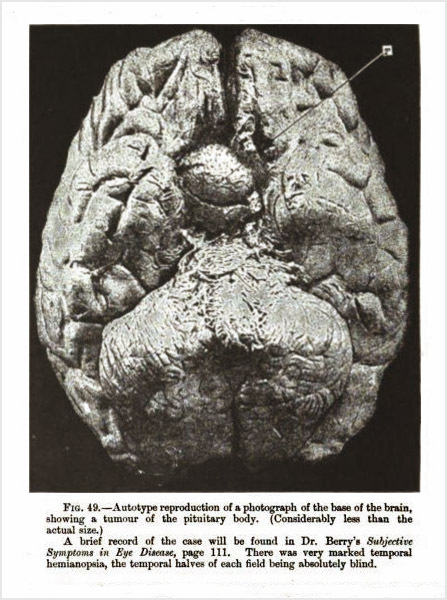 Bramwell's classical study on the physiological consequences of brain tumors and cerebral aneurisms. Of particular value are his observations on tumors of the pituitary body. Much of the material was culled from lectures and papers already published in the Edinburgh medical journal — vide: Berry & Bramwell »» ; vide: Bramwell »».